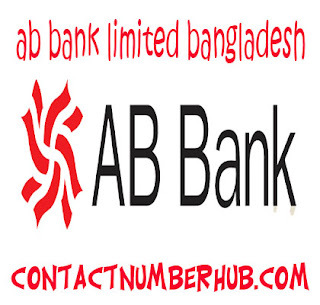 AB Bank formerly was known as Arab Bangladesh Bank. It’s one of the leading private bank in Bangladesh was established in December, 31, 1981. It was first joint venture bank among private sector. It got the recognition as the AB Bank from former Arab Bangladesh Bank approved by the Bangladesh bank in 2007. It was charged with a former deputy managing director embezzling BDT. 3.25 billion. The bank is aimed to secure the position of the leading banking service provider creating long lasting value for the honorable clients, shareholders along with its employees. The bank has formulated an envious legacy of a golden heritage that might not be imitated through many. You’re looking for the contact number to communicate with AB Bank for your different purposes, including internet banking, complaints, opening an account and much more. The bank has achieved huge milestones along with incorporating various changes within last 35 years. It always tries to authenticate to offer technology oriented innovative and modern banking in Bangladesh. For these reasons, it provides different technology and latest banking services, including internet banking, cutting edge ICT, SMS banking, state-of-art network solution and 24/7 ATM service. AB Bank has offices around the world, including KSA, UAE, England, Pakistan and many other countries. Ø Monitor your account’s activities. Ø View your transaction history. Ø Check your account balance. Ø Money transfer to any other bank account in Bangladesh. Ø Get Mini Statement of your account. Ø View & Print your account statement. Ø Pay your utility bills of Dhaka WASA. Ø You can pay Post Paid or Pre Paid bills of any operator. You have chance for SMS Banking in AB Bank. You must register your mobile number. Follow the following processes and these all are free of cost. For your mobile registration call @ 16207 or +880967816207, or use the email address: support@abbl.com. You can contact this number 16207 to the “Central Customer Service & Complaint Management Cell” to register any of your problems. Or, you can send them email to: ccsandcmc@abbl.com. If the AB Bank customer care number and other information are helpful to you, it will make us glad. For any further information, contact with us or comment. We shall try our best to resolve your issues.